Standards-based practice and review. Daily. Sequenced. Structured. Organized. 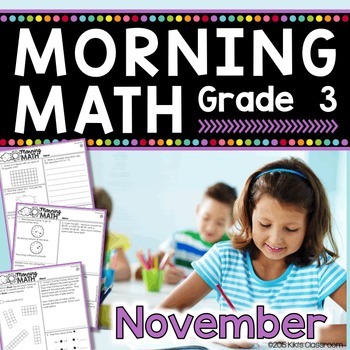 The Grade 3 Morning Math: NOVEMBER Pack includes 23 pages of printables to help establish your morning classroom routine and provide daily, structured, spiral math practice and review. You’ll find these printables to be rigorous, thoughtfully designed, CCSS-aligned, and thorough. 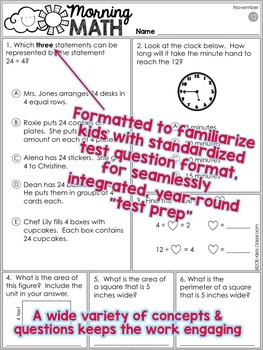 A variety of question formats is included, to familiarize students with the standardized test format, in a truly seamless, “test-prep-all-year-'round” approach. Morning Math turns those first several minutes of the morning into an efficient use of instructional time. After students complete one page of Morning Math, we go over their work together using the document camera, so that we can share our thinking and identify concepts that need further review. It's a great opportunity for modeling, teaching, and reteaching in a quick, daily dose. • standards-based practice for early finishers. 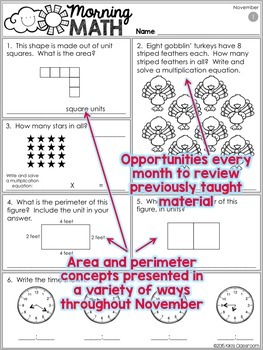 A fun, blackline “November Morning Math” cover page is included, should you choose to copy this as a packet at the beginning of the month. Please follow my store to be notified when new monthly packs become available! 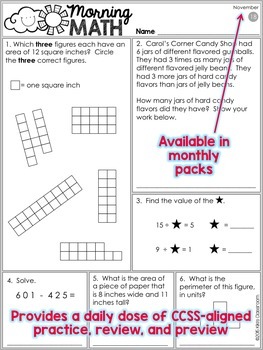 Be sure to see the Grade 3 Math MEGA Bundle, too! …and please find all of my Test Prep products HERE.